The face of downtown Rochester is changing. Several new residential construction projects are underway, signaling a change in attitude about the city. At least 15 housing projects, many converting old commercial buildings into loft apartments, are planed or under construction. Construction is underway for a lifestyle development downtown — one that is being fueled by Geva Theatre Center. Investor and property owner Eduard Nakhamkin and developer Patrick Dutton are currently working on Woodbury Place, which is located on a historic corner in the area known as Washington Square. It is bordered by Woodbury Boulevard, South Avenue, Capron Street and St. Mary's Place. To house actors, Geva has signed a 10-year lease for 11 lofts, which will represent about 30 percent of the total number of residential units once both phases of the development are done, Dutton said. When both phases are completed, the five buildings formerly occupied by Merkel Donohue will be redeveloped. "It's significant for Geva, for Washington Square and for downtown Rochester," said Dutton, whose development also will include retail and restaurants. The development is one of at least 15 projects underway downtown that have housing components, and represent about $370 million worth of work. The first phase of the Washington Square project, which will be done in January, will include 19 lofts and 10,000 square feet of retail space. "We need quality housing to attract quality actors," said Geva Executive Director Tom Parrish. Right now, the regional equity theater rents space for actors in Gates. "This is a fantastic improvement for housing," said Patrick Noonan, 43, who has acted in Geva plays since 2007 and stayed in the current apartments. He has since made Rochester his home base. 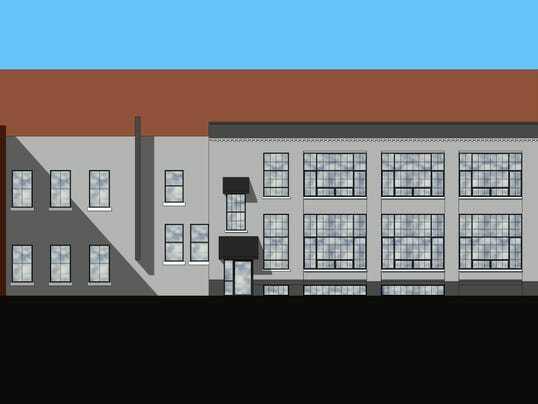 The redeveloped buildings will highlight the existing architectural features of the buildings but will also include modern, loft-style design with exposed brick, rooftop patios and gardens, refurbished wood and concrete flooring, Dutton said. The project is led by property owner and investor Nakhamkin, a Russian-born former art dealer who currently lives in Miami. Nakhamkin purchased the property eight years ago and teamed with Dutton to develop it. Mayor Lovely Warren lauded the development. "We are a city on the move," she said. "We are a city that's coming back."